This Bronte Beach single family home in Sydney, Australia is a home that most people only dream about. The on-beach location allows for endless fresh air and sunshine while the floor to ceiling windows that surround the home keep the living easy. 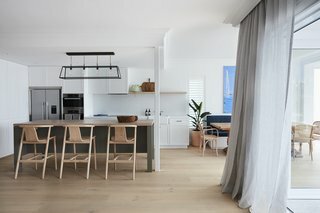 Renovated in 2018, Lane and Grove Architects updated the facade of this ocean front four bedroom, three bath home, replacing hinged doors to the terraces with sliding doors. The prevailing monochromatic beige facade gave way to a contrast in upper and lower elements allowing the building to become grounded by darker, heavier colors and textures. The addition of the Robert Plumb Project New Guinean timber screens softened the edges, adding interest whilst maintaining light and privacy. British lighting manufacturer Original BTC lights, Diner 125 and Box Wall Lights, were supplied by local Australian distributor, Dunlin, for the kitchen and entryway of the home. Additional information about the lighting design can be found at www.origionalbtc.com. uploaded Bronte Beach Marine Residence through Add A Home. Original BTC's Diner 125 pendant in weathered brass. The light has 4 lamp holders, with glass on 4 sides and an open top and base.